G'day again all! Welcome to the second pyro newsletter. I know, it's a bit late coming but I've been getting ready to head up north to do the Sydney Working With Wood Show so time has been a bit on the thin side. I wont waffle on too much in the intro to this edition because it speaks for itself; Denise Meyers. 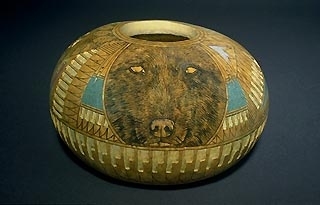 For those of you who are into gourd art, she needs little introduction. 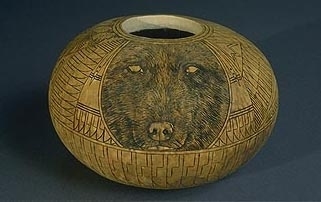 For those of you who are unfamiliar with the name, Denise has earned a reputation as one of the best known gourd artists in the world. You will see this is well deserved. 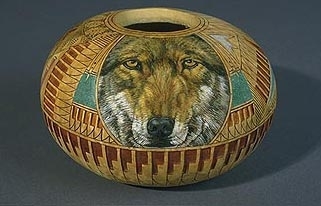 Her work displays a combination of unique design, beautiful colour, enriching inlay, enhancing pyrography and stunning wildlife portraiture. When I first saw Denise's work I was very intrigued to know what part pyrography plays in it's production. I contacted Denise and she graciously took the time to answer my questions in a detailed and generous manner. I myself am a big believer that sharing knowledge helps greatly in promoting an art form, especially those that are not given due credit compared to the more well known mediums. I want to thank Denise for sharing her knowledge with us. It's much appreciated. For those of you who would like to see more of her incredible work, you can find Denise's web site by clicking here. Denise had also released a new calendar choc full of her beautiful art work. To see this, please click here. The interview with Denise is so complete that little else is needed for this issue...except to mention the latest online pyrography article by Kathleen Menendez. Kathleen writes the 'Pyrograffiti' article for each edition of the Woodcarvers Online Magazine. Do yourself a favour and read her latest pyrography offering and feast your eyes on some truly stunning pyrographic work. Lastly, there have been a lot of new subscribers to the 'pyro newsletter', so I would like to include a link for Newsletter #1 if you would like to have a look. Q: How long have you been working with gourds and when did you start using pyrography on them? A: I started working with gourds about twelve years ago, when I took a class from a gourd artist who was selling her work in the bookstore where I was employed part time. I was a struggling screen writer in Hollywood, and I was getting rather fed up with the film business, so I thought a career as a bookstore owner looked like a nice option. I never dreamed I'd stumble onto an even more satisfying career as an artist, even though I was an art major in college (I didn't think I was good enough to make it as an artist, so I went into broadcasting instead). I woodburned on gourds from the beginning, because the artist who taught the class was a proponent of woodburning. Q: Why gourds? Or have you burnt on other mediums/wood as well? A: Gourds are perfect for woodburning, since the ones I get are thick enough to do just about anything with. And since I started out woodburning on them, it seemed only natural to continue to explore woodburning as part of my artistic expression. I have tried woodburning on wood, but don't find the results as satisfying, in part because wood is flat and gourds are curved in to directions. I'd probably sell better if I used wood, since its not a medium you have to educate people about, the way you have to educate them about gourds. Q: Are you a self taught in pyrography or did you learn from a source? A: I am self taught. But I was always a natural with a pencil and a piece of paper, and since the woodburning tool I use (a Detail Master) has such fine tips, its just like pencil drawing. Q: Why did you start pyrographing your gourds and not just paint alone? A: Woodburning allows me to invest the pieces with dimension and texture, which makes the work even more impressive once it's been woodburned and then painted. People are amazed by the combined textures, and I have often found myself arguing with someone over whether I have used real hair, or glass eyes in my wildlife pieces (for example), because the woodburing lends that extra element that makes the work a real standout. Q: How important a part does pyrography play in the making of your gourd art? A: It's everything. Without it, I think the work would lack depth and dramatic impact. Q: Roughly, what percentage of your total time taken on a piece is spent on pyrography? A: Not as much as it might seem. As a matter of fact, carving, gemstone inlay and painting all take more time than the woodburning, only because I am not a natural painter, and the gemstone inlay takes twelve hours to dry, so I would guess that time spent on woodburning would be about thirty to forty percent of the final process. Q: You seem to use a lot of pyrography in fur texture, such as the wolf on your web site. This is then added to by painting over the burnt picture. Do you paint over all of the burning or leave some burning to show through? A: I paint over the wildlife pieces, although I do leave some of the geometric designs unpainted to provide balance. I use acrylic paint to paint the wildlife, which allows me to thin the paints with water, and apply as many coats as I need to achieve the desired effect without obliterating the woodburning. Q: Do you clean or prepare your burnt surface in some way before starting to paint? A: Yes. I sand the entire gourd after woodburning to remove the resin that results from the initial woodburning process. It creates a nice smooth surface for painting. Q: What type of paint do you use over the burnt area? A: I use acrylics and some leather dyes, although I usually "over paint" the leather dyes since they aren't color fast. Since they are a liquid and apply evenly on a gourd, I use them as the base coat for the acrylic "wash", then finish the entire gourd with an ultraviolet sealer to protect against sun damage. Q: Have you ever done purely monochrome pictures as part of your work? A: I haven't just because I enjoy experimenting with color. I expect to do a line of gourds with no added color at some point in the future though. Q: Do you also utilize pyrography on subjects of a more smooth texture, such as fish? A: I use a 1/8th inch fish scale tip for the fish pieces. The tip is the exact size of one rainbow trout fish scale, and since you can only woodburn one fish scale at a time, it takes FOREVER to woodburn a fish. Fish scales also have a specific pattern, so you can't jump ahead to something else if you get bored with the pattern. Q: What burner/burners do you use? A: I use a Detail Master woodburning set, with the temperature gauge and two pens. Although I can only use one pen at a time! Q: What are your preferred nibs and what do you use them for? A: I use the 10B almost exclusively. It allows me to do just about anything I want to do, from drawing long straight lines, to creating the rough texture around a birds beak, or the extremely fine hairs of an elk's face. I also use the fish scale tip. Q: Do you also use pyrography in your geometric line work? Q: What motivates you to choose the subject matter you do? 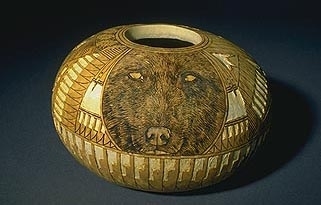 A: Sometimes the gourd speaks to me and tells me what it already is, and sometimes I want to experiment with a subject or animal I haven't tried before. I have a gourd that has been sitting in my garage for ages, and the other day, I looked at it and realized it was a herd of elephants. I just finished woodburning it, and will start painting it soon, and I'll tell you, it was one of the easiest gourds I've ever put together. I often tell people I feel like a facilitator, because in most cases, the work already exists inside the gourd. It's my job to make it a reality. Q: Do you work in other art mediums other than gourd work? A: I have just taken up oil painting, which I find interesting, because it's a flat surface and I have grown so accustomed to working on curved surfaces, so I find it hugely challenging to paint canvasses. I am not comfortable with oil painting just yet, since I have worked with acrylics since starting out, and also because I don't consider myself a natural painter. I feel like I really have to work at it, even though the oil paintings I have completed so far have turned out exceptionally well for someone who doesn't know what she is doing!